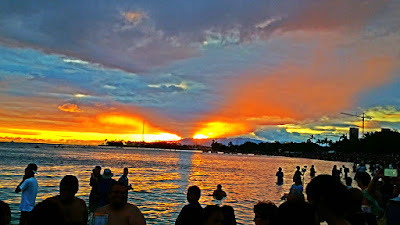 I’d like to end the week with this sunset photo taken at Ala Moana Beach Park. I took this on the day of Lantern Floating Hawaii. I especially like how the array of clouds provided a dramatic look almost like a giant hurricane was on the horizon. That is the beauty of nature.. no two sunsets are ever alike. Hope everybody has a great weekend. 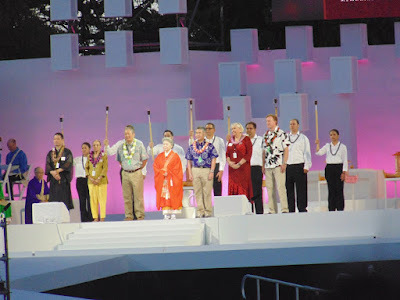 At Lantern Floating Hawaii Her Holiness Shinso Ito and some dignitaries including Governor David Ige prepare for the Light of Harmony ceremony. In the spirit of friendship, community leaders from various sectors symbolically demonstrate their unified commitment to creating harmony and diversity by lighting the flame. 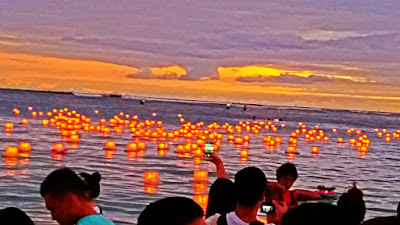 Here is one of the better shots I took at Lantern Floating Hawaii this year. There were so many people in the water and I was unwilling to carry my camera and phone to chest deep level so forgive the people in the shot. I used some HDR to be able to get the sunset as well as the nice colorful lantern glows.